Emilio Izaguirre is set to sign a new deal at Celtic; the SFA and Gordon Strachan believe Scotland can still qualify for the 2018 World Cup, and Ally McCoist has backed Joe Garner to shine at Ibrox. Emilio Izaguirre is close to signing a new deal with Celtic after deputising for the injured Kieran Tierney in recent weeks. Moussa Dembele will break the Scottish football record for a transfer fee received when they eventually sell Moussa Dembele, according to Brendan Rodgers. The SFA and national team boss Gordon Strachan both believe Scotland can still qualify for the World Cup in Russia. It was announced yesterday that Strachan will continue in the coach’s position despite a dreadful start to the current campaign. Ally McCoist has backed summer signing Joe Garner to make a name for himself at Rangers after a stop-start beginning to his Ibrox career. Hearts will wait until January to discuss contract extensions with centre-backs Igor Rossi and Alim Ozturk. Both players have agreements expiring next summer but formal talks will not take place until after New Year. The quicker Hibernian players can wrap up the Championship title, the sooner the club will be in a position to discuss new contracts. Top of the Championship table and favourites to secure promotion back to the Premiership, the Easter Road side have 13 players nearing the end of their current contracts and manager Neil Lennon says the negotiations will accelerate as soon as the club knows which league it will be contesting next term. 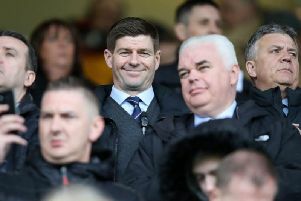 MK Dons have held early talks with Steven Gerrard over their managerial position it is understood. The 36-year-old midfielder announced earlier this week that he will not be renewing his contract with the Los Angeles Galaxy when it expires and was linked with a move to Celtic. Rangers boss Mark Warburton has denied rumours he’s had a falling out with striker Martyn Waghorn. Reports in England had the striker moving to Bristol City in the January transfer window, due to a falling out with Warburton.